It’s time for a review, but this time it’s of a cat food. From the time I used to rescue cats, I learnt that the cheap cat food ends up costing you more. First, the cat needs more food to get really fed. Secondly, you don’t even want to know what’s inside the food. Last but not least, the food doesn’t contain the minerals, vitamins and other ingredients which the cat needs to be healthy. I can give you a whole list of cat food brands from the more expensive range which is not good either, but this is not the subject of this post. I’m always on the search for good food for my princess. 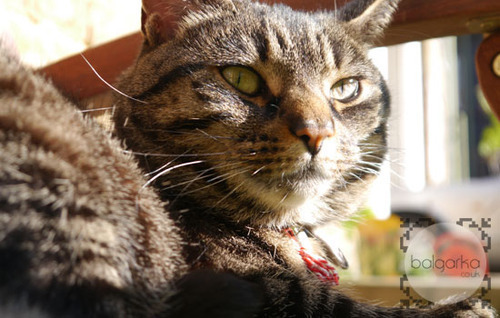 I was asked to make a review about the Harringtons cat food – proudly made in Britain using natural products. My fluffy princess got to try it for a couple of weeks and I’m ready with the results. Harringtons started making animal food and later developed as a pet food manufactorer in the mid 1980s. Three generations later they are still a family run business using local Yorkshire ingredients and aiming of making premium pet food at affordable prices. When the 2 kg pack of Harringtons Adult Cat Complete Chicken with Rice arrived, I opened it immediately for a quick sneak. Regularly looking cat biscuits, but they smell so much better than the majority of other cat food. Even my man, who dislikes the smell of cat food, confirmed that this one smells of natural ingredients. There is no need to mention, that my cat Matsy is a foodie and loves to eat. This time though, I gave her a few biscuits to try and they were gone in a second. Two big eyes and a noisy “Mmmhrrrr!” showed me that she wanted more! The first few days she ate quickly, loudly and always tried to get extra. So obvious that she loved the taste of the new food. For the very reason that Matsy loves food and is a very good human manipulator, I weight her food portions so we don’t wonder if she had enough or not. I give her half a pouch (equals to 50g) of Purina Felix in the morning. Throughout the day she sleeps a lot, plays a bit and walks in the yard if the weather is dry – she doesn’t get too exhausted with activities. In the evening just before we sit for dinner, she gets her dinner portion of cat biscuits. I give her a little bit less than half of the amount recommended as a daily dose for adult cats, because she’s a small and not very active cat. She gained a belly pouch when I used to follow the instructions strictly which made me reduce the evening portion. 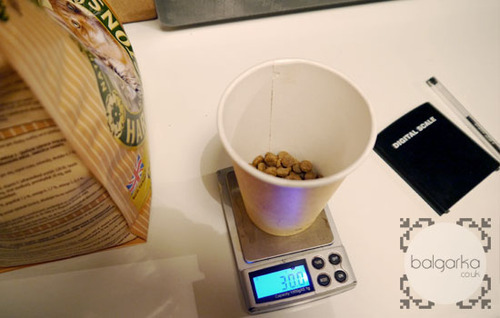 The recommended feeding dose from the Harringtons Cat Food is 80-100g for small cats. She gets 30g in the evening. Since she started eating Harringtons Adult Cat Complete Food, she became much more active. Rather than going to sleep through the whole day or lazily gaze through the window, she would pick her mouse toys and run happily around the flat or in the yard. She does much more running around during the whole day and entertains herself with almost anything – like that stick on the photo above. 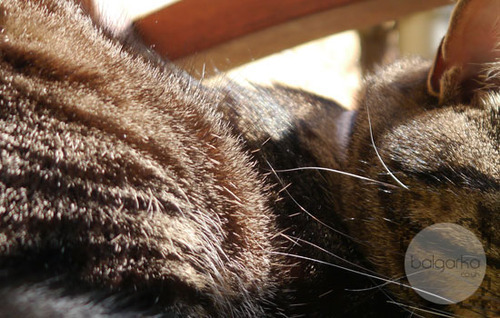 One of the best visible signs of a cat who eats well is her fur. Matsy’s coat became even sfoter than usual, feels like silk, and is very shiny. 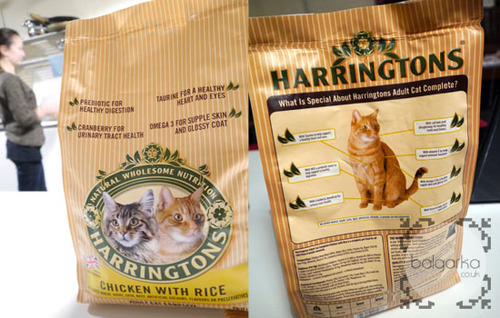 I definitely like the Harringtons Adult Cat Complete Food and will be buying more of it. On the next shopping I will try the other flavour – Rich in Salmon with Rice and some of the Hairball Control Treats. I already checked if Harringtons Pet Food is available in the super markets and I was very happy to find it in Tesco and Asda, where I normally do some of my cupboard shopping. It costs around £5.50 for 2kg pack. You can also find it in some online pet retailers, such as Monster Pet Supplies which I used for the Charity Shopping for RSPCA once. Harringtons supply pet food within the UK and France. See full list of the retailers where you can find them here. 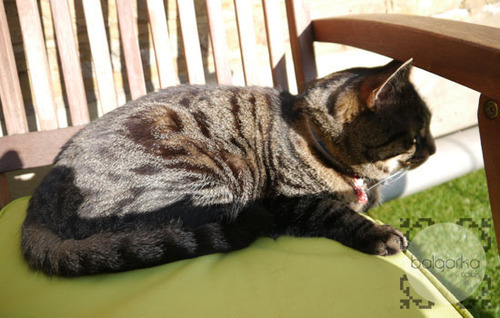 If you’ve been previously wondering about Harringtons Cat Food, I hope you found my review useful. I’ll be happy to hear what do you think too, so leave me a message below.